Q: President Xi Jinping just wrapped up his visit to the Philippines, during which the two sides agreed to elevate the bilateral relationship to a comprehensive strategic and cooperative one. Can you give us more information? A: From November 20 to 21, President Xi Jinping paid a state visit to the Philippines. The Chinese side has already released relevant readouts, and State Councilor and Foreign Minister Wang Yi also briefed on the outcomes of the visit. Here, I would like to briefly make a few points. China and the Philippines are friendly close neighbors facing each other across a strip of water. China has been developing cooperative and friendly relations with the Philippines on the basis of mutual respect, treating each other with candidness, equality and mutual benefit and win-win cooperation. Just as you may have noted, President Xi Jinping just concluded his visit to the Philippines. This is his first visit to the Philippines and a first one to that country by Chinese head of state in 13 years. During the visit, the two heads of state jointly charted the course for bilateral relations going forward and reached important consensus, deciding to elevate the relationship to a comprehensive strategic cooperative one. This demonstrates the two sides' determinations to adhere to good neighborliness and advance mutually beneficial cooperation. During the visit, the two sides also achieved a series of key outcomes on strengthening practical cooperation. We agreed to advance cooperation in three pillar areas of security, development and people-to-people exchanges, signed a MOU on the Belt and Road and cooperation documents on maritime oil and gas development, and concluded around 30 cooperation agreements in such areas as infrastructure, energy, agriculture, finance and telecommunications. China will continue to help the Philippines with more of its poverty relief and other social and livelihood projects, expand communication and cooperation in education, culture and tourism and build a new arena for the two peoples to understand and forge friendship with each other. The China-Philippines cooperation has demonstrated vitality and taken on a new look unprecedentedly with the structure of cooperation continuously improving, which will surely bring more tangible benefits to the two peoples. China is willing to take this visit as an opportunity to build the traditional friendship and deepen cooperation with the Philippines to achieve shared development and prosperity. Q:As far as we know, a delegation from the UN Security Council will visit China this week. So can you give us some details about this visit? Will they meet President Xi Jinping or any other Chinese leaders and what does China expect from this visit? A: As far as I know, China has invited the permanent representatives of all member states and the member states-elect of the UN Security Council, the main troop contributing countries of the UN peacekeeping operations and senior officials of the UN Secretariat to visit China in the second half of this month. By then, the two sides will exchange views on such issues as the role of the UN under the current international situation and China's cooperation with the UN. In addition, the delegation will visit the China peacekeeping standby force. But I'm not aware of the specific schedule and I can try to check on that for you later. Q: The Filipino Foreign Secretary disclosed details today about the oil and gas MOU signed this week with China, saying that the two sides had pushed for a full joint exploration deal previously. How does China comment on that? He also said that the Philippine side would not release the full text without Chinese approval. Will China approve the publication and if not, why not? A: The signing of this MOU between China and the Philippines signals a new step forward by the two sides in joint oil and gas exploration and development. The two sides will continue with further discussions on relevant specific issues. China looks forward to advancing the maritime practical cooperation between the two sides in an all-round way and reaping harvests at an early date to benefit the two countries and peoples. In the meantime, China also looks forward to conducting such cooperation with other littoral countries of the South China Sea so as to make the South China Sea a sea of peace, friendship and cooperation. 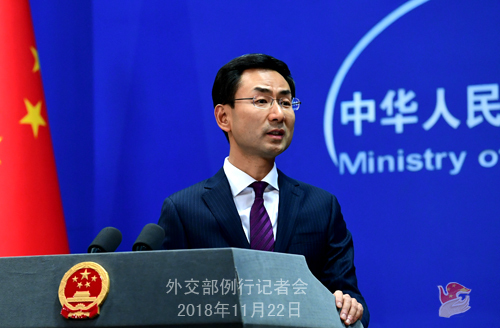 The Chinese side has consistently advocated "shelving disputes and joint development" in the South China Sea and promoted cooperation in relevant fields including oil and gas to truly benefit the littoral countries and their people. 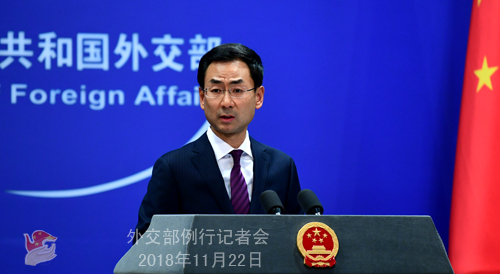 China is willing to continue to maintain communication and cooperation in this regard with relevant countries in the South China Sea, including the Philippines, and strive for substantial progress in joint development in the South China Sea at an early date. As for whether the content of the MOU will be disclosed as you mentioned, as far as I know, during the visit of President Xi Jinping to the Philippines, China and the Philippines signed a series of cooperation documents. Each document was signed on the basis of full consultation and consensus between the two sides. Which document can be made public depends on the understanding reached between the two sides in the negotiations as well as the relevant provisions in the terms of the document itself. Follow-up: The Filipino Foreign Secretary said that he is perfectly willing to publish it and he just needs the go-ahead from the Chinese side. A: I have just said that which document can be made public depends on the understanding reached between the two sides during the negotiation process and whether that is clearly provided in the text of the document itself. Q: According to reports, recently Zambian President Edgar Lungu criticized the false accusations against China-Zambia cooperation when talking about the China-related riot in the Copperbelt province not long ago. Do you have any comment on that? A: Early this month, some people in Kitwe of the Copperbelt province were misled by the false allegation about the takeover of the Zambia's state-owned timber company by the Chinese side and took to street to protest, causing a minor disturbance. Some Chinese shops were looted but no one was injured. After that happened, the Chinese side immediately lodged representations with Zambia, and the Zambian side said it would take measures to safeguard the safety of the Chinese in Zambia. Recently, Zambian President Lungu openly refuted the false accusations against China-Zambia cooperation and clarified the facts of the riot, calling on the Zambians to boycott those false China-related reports and provide enabling environment for foreign investors, including Chinese ones, to operate in Zambia. Previously, Zambian Vice President Inonge Wina also pointed out that the protests in the Copperbelt province recently were caused by false allegations and that Zambians should not be misled. The Chinese side appreciates the above-mentioned remarks by Zambian leaders. The traditional friendship between China and Zambia has withstood the test of time and the changes in the international landscape. In recent years, the practical cooperation between the two countries has achieved remarkable outcomes and brought benefits to the two peoples. The Chinese enterprises' investments in Zambia have generated enormous job opportunities and boosted the socio-economic development locally, to which we all bear witness. Any responsible person will make objective evaluation of all these efforts, and any words and deeds intended to spoil China-Zambia friendship will never win the hearts of the people in the two countries. China stands ready to continue to work with Zambia to stay committed to win-win cooperation and common development and cement and deepen the friendly and cooperative relations between the two countries. Q: According to reports, on November 21, Chairman of the Council of Economic Advisers of the White House Kevin Hassert said that China had "misbehaved" as a member of the WTO and that we should consider whether to pursue evicting China from the WTO. Analysts say that has implied something. What's China's comment? A: The WTO is a multilateral institution, one that is not run by the US. WTO members are all equal, rather than dominated by the US. Certain individual in the US hinting "evicting" China from the WTO, though a fool's talk, fully exposed the bullying features and self-important mindset of the US. According to incomplete statistics, recently, the US has withdrawn from such international organizations as UNESCO, the UN Human Rights Council, the Universal Postal Union, and pulled out of a series of international instruments including the Trans-Pacific Partnership Agreement, the Paris Agreement on climate change, the Global Compact on Migration, the Joint Comprehensive Plan of Action and the Vienna Convention on Diplomatic Relations and Optional Protocol on Disputes. The international community has a fair judgment of the US acts of scrapping pacts and quitting international organizations under the pretext of "America First", raising deep concerns over the US practice of approaching multilateral institutions and applying multilateral treaties in a selective way. If my memory serves me right, not long ago the US even threatened to withdraw from the WTO, and now it hinted evicting China from the WTO. How ridiculous! The differences between the WTO members can surely be resolved through negotiation and consultation, and the wanton threat of "evicting" others is very dangerous. China is the largest trader in goods and the second largest economy in the world. If the US now can threaten to evict China from the WTO, then what about the other countries? Who will be the next? Since its accession into the WTO, China has actively fulfilled its commitment. In last July, the WTO reviewed China's trade policies. The WTO Director-General and other parties have spoken positively of China's supports and contributions to the multilateral trading system and highly appreciated China's increasing role in the WTO. China has been committed to building an open world economy, firmly supports the WTO-centered multilateral trading system and stands ready to work with various parties to promote the WTO reform based on its own core values and basic principles in keeping with the times. In the meantime, China steadfastly upholds multilateralism and the rules-based international order and is willing to work with other members of the international community to build a new type of international relations featuring mutual respect, fairness and justice and win-win cooperation and forge a community with a shared future for mankind. 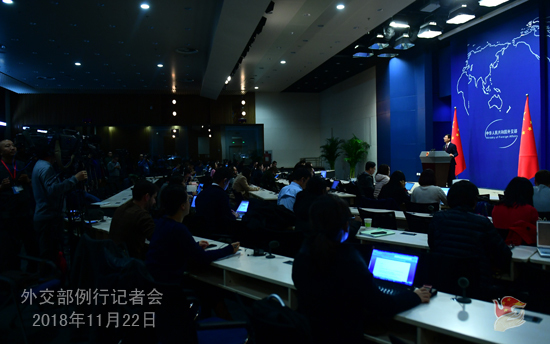 Q: Can you provide details on the program of President Xi Jinping going to the G20 meeting next week? A: Just hold on and the information will be coming soon. Please wait for that. Q: An Italian fashion designer of Dolce&Gabbana caused a protest in China for some insulting comments online, and he claimed it was because his social media account was hacked. What is you comment on the episode? A: This is not a diplomatic question in essence, nor do we hope it will escalate into a diplomatic one. So I believe it's better for you to ask the Chinese people instead of the Spokesperson of the Foreign Ministry for how the incident is viewed in China.